Today, you are a member of... C = 2r = d - You Are A Member! Sure, going round and round can make your head want to explode, but all that g-force isn’t without mathematical perfection. 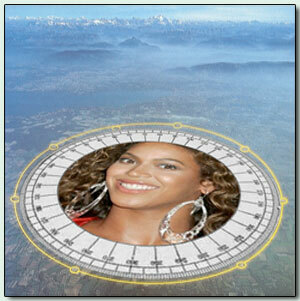 Whether on an arc, chord, segment, sector, tangent or sagitta know you have some pretty decent patron saints: Pythagorus, Apollonius, Plato – in addition to modern day circle enthusiast like Beyonce, who know that the best way to understand math is to have it as close as possible to your head in the form of giant earrings. So this week if the travel on closed curves that divide the plane into interior and exterior induces vestibular illustions, pray to the gods of numbers and booty-shaking numbers and and get your circuit on because, as Ms Dickenson knows, therein success and your sea legs lies.